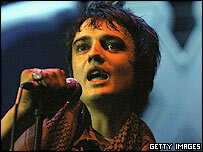 Musician Pete Doherty has been given a one-off change to his bail curfew to allow him to play a gig. The ex-Libertines singer, 25, appeared at Snaresbrook Crown Court charged with robbery and blackmail, with Alan Wass, 23, guitarist for the band Left Hand. Both were arrested on 2 February after an alleged dispute with documentary maker Max Carlish at a London hotel. The judge said Mr Doherty could stay out two hours past his 2200 GMT curfew on Tuesday for the Brixton Academy gig. His bail conditions normally forbid him from going out between 2200 GMT and 0700 GMT. The judge also agreed to lower the singer's bail surety from £150,000 to £50,000. He agreed to allow him to perform at the concert on condition that requests for changes to his bail conditions were "not too regular an occurrence". Mr Doherty, dressed in a black suit and tie, white shirt and navy trench coat, confirmed his name as his stood in the dock alongside Mr Wass, who wore a grey suit, black shirt and a large star emblem silver chain. Both men are due to reappear in court on 18 April. Mr Doherty left the court in a black Mercedes after being greeted by fans. The singer, a self-confessed drug addict and now singer of the band Babyshambles, has attracted widespread media attention since being involved in an on-off relationship with model Kate Moss, 31.